Smoke taint study equipment runs the length of a hoop house of wine grapes at the WSU Prosser research center near WSU Tri-Cities. 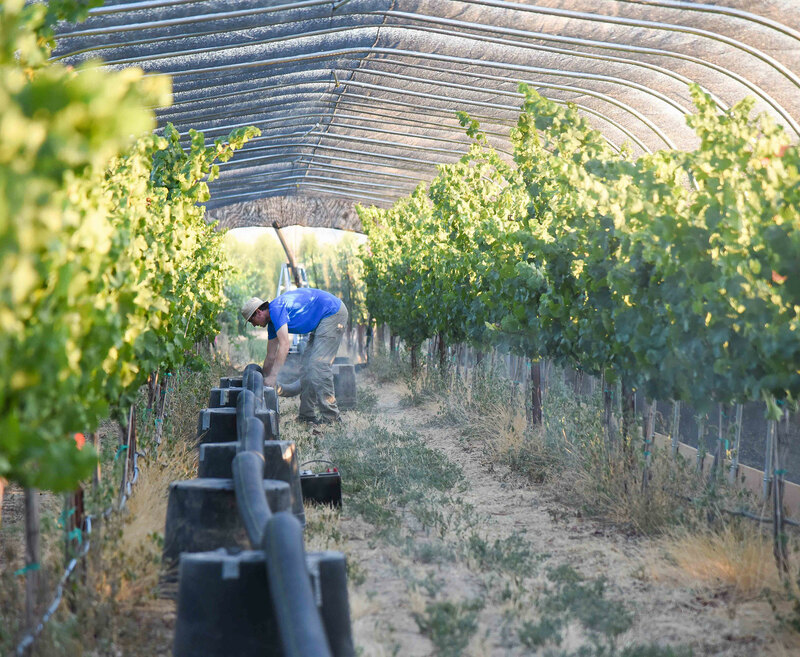 RICHLAND, Wash. – Wine grapes may appear fine after a harsh wildfire season. But if grapes have smoke taint, the finished wine may taste and smell awful – an unpleasant surprise for growers and wine lovers alike. 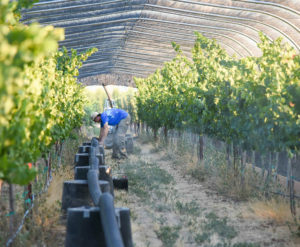 In a new study, Collins is exposing vines to smoke to better understand how the chemical composition of grapes changes. He wants to know how much smoke it takes to create smoke taint in wine grapes and wine, as well as how to lessen the problem. Fred Burke, a science teacher at Chiawana High School in Pasco, Wash., helps set up smoke taint study equipment in a hoop house at the WSU Prosser research center. Burke is participating in the regional Partners in Science program funded by the M.J. Murdock Charitable Trust. He uses a smoker to pump fumes into a hoop house with 60 riesling vines. A second house of vines acts as a control. He is doing the same study on cabernet grapes. He will examine samples of leaves and fruit, then make wine from the grapes for chemical analysis. Taint is invisible on the leaves or fruit, but appears when wine is made, influencing aroma and aftertaste. Severity of taint depends on the number and size of wildfires in a season, as well as movement of smoke. Not all wines made during severe fire seasons are tainted with smoke, Collins said. Smoke taint is created by compounds in the smoke that bind with sugar molecules to form glycosides. He said there is evidence that the same thing happens when a person drinks the wine. In either case, the problem can be identified by chemical testing during the winemaking process. There are ways to remove free compounds from the wine, but no effective ways to remove glycosides, Collins said. Most research that has been done so far is based on high intensity smoke for short periods of time. It is hard to smoke a vineyard for an extended period of time because of heat buildup, Collins said. “What we are trying to replicate here is low intensity smoke for an extended period of time, which is more typical of actual smoke exposure from wildfires,” he said. The first year of trials will demonstrate smoking methods, followed by research on how variables like fuel source, grape variety and time of year impact the severity of smoke taint.